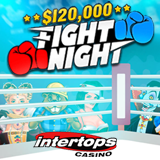 Intertops Casino, one of the world’s oldest and most trusted online casinos, is pulling no punches this month during its $120,000 Fight Night casino bonus giveaway. Frequent players are competing against each other for top weekly bonuses -- $30,000 in prizes will be awarded every week until July 10th. At the end of the fight, the undisputed champion will win a $1000 Cash Prize with no wagering requirements. The casino is also launching a new game this month! Cash Bandits 2, a sequel to the popular slot featuring bungling burglars and a vault full of bonus features, is expected next week in the download, instant play and mobile casino. The new game will have a free spins bonus feature awarding almost criminal prize multipliers. $30,000 in weekly frequent player bonuses -- up to $500 each.